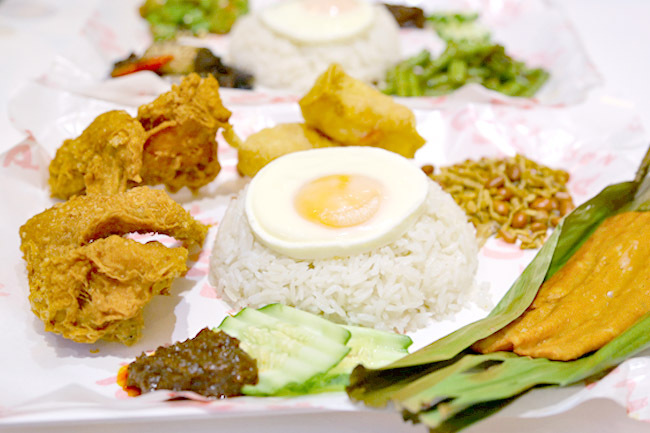 Ponggol Nasi Lemak goes upmarket, like a local version of a fast-food restaurant. Good for them. It also reminded me of fellow Nasi Lemak makers Qiji, which turned from humble hawker stall to a chain of shops. 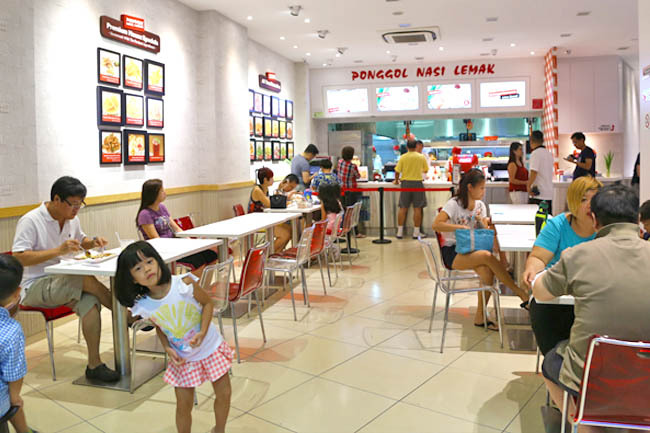 Fully air-conditioned, two storeys, red and white decor (the typical fastfood colours), self-service food ordering system, and kitchen in sight at the back. Many hawker stalls have attempted to ‘upgrade’ themselves by turning into modern eateries, though they meet with varying degrees of success. Some have plummeted sales due to inconsistent qualities, while some others transformed passionate hawker food to soulless machine-churned items. Third generation owner Edmund Ang does a half-and-half. He invested in automated machines to speed food preparation, while continues to undertake the laborious task of preparation of signature items and guarded sambal recipe. For convenience, there are four sets. I foresee many would order the Set 3, a double chicken wing and ikan bilis (anchovies) plate at $5. 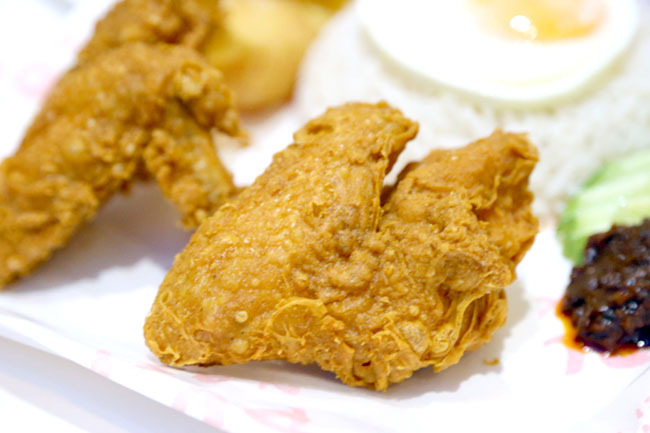 All time favourites are available as add-ons, such as crispy wings, fried fish, egg, luncheon meat, long bean, spicy shrimp floss, homemade archar and lady’s fingers. Word of caution: If you happily point point point, each plate could easily end up to be about 10 bucks. 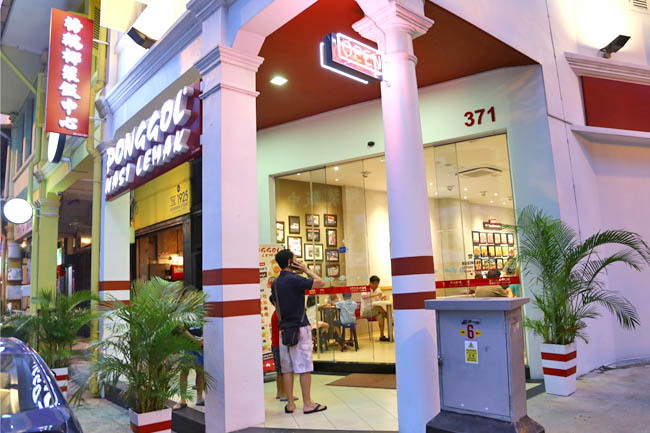 There are some house specialities which can also be found at this Jalan Besar outlet – crispy chicken skin with curry leaves ($1.50 per serving), ngoh hiang ($1.50 per piece) and seafood dumpling ($1.60 for 2 pieces). Regretted ordering the last one though. The centre was rather hollow. Thai Hom Mali grain is used for the rice, which did give it an edge – long grained, aromatic, resonating with flavours of coconut milk. The overall feel was dry, compared to some other nasi lemak rice which could be more moist and fluffy. Personal preference. I do like the Punggol Nasi Lemak’s rice. The winner is really in its home-made sambal chilli sauce, which brought the chicken wings (and other items) to another level. The wings on their own were crispy, but if I were to nit-pick, could be juicier with more flavours. So adding chilli did the job. 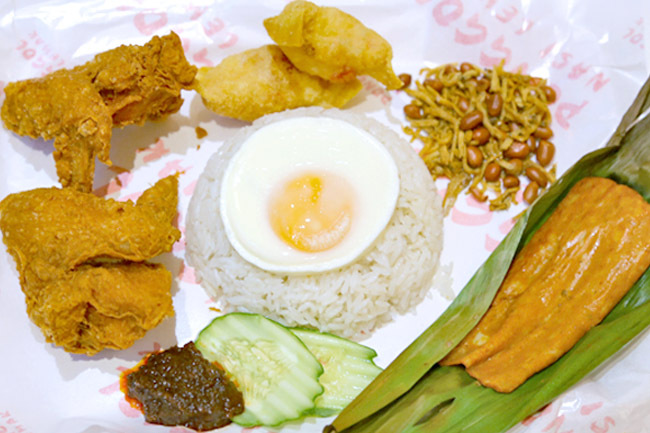 This Ponggol Nasi Lemak would become a favourite supper haunt for many. Judging from its popularity, it won’t be long before they open more. Hi Daniel, do you have any recommended place for Nasi Lemak in KL?